Did you or someone you know get food poisoning due to a food provider’s negligence? If so, call Lance Andrew, P.C. to schedule a free consultation with a Utah food poisoning lawyer. Lance Andrew, P.C. is a personal injury law firm located in Downtown Salt Lake City that handles Utah food poisoning claims. Our experienced foodborne illness attorneys have represented a wide variety of foodborne illness injury cases and have recovered millions of dollars in settlements and verdicts for our clients in Utah and around the country. We charge no hidden fees or costs. We will not charge a fee unless we recover the damages for you. Food poisoning comes from eating contaminated food that contains bacteria, parasites, viruses, or other contaminants. Contaminated food in public establishments can be the result of the establishment’s negligence, therefore you may be able to seek compensation for injuries you have sustained from food poisoning. The cost of recovering from a foodborne illness can build up quickly with hospital visits, lost time, and an inability to work. Let a Lance Andrew, P.C. Utah food poisoning lawyer help you recover the compensation you deserve. If you were at any of the establishments listed above during those dates, call us today for immediate legal assistance! Why Should Lance Andrew, P.C. Represent You? Our food poisoning lawyers travel all over Utah. Most attorneys require client meetings to be held at their offices. We want to remove the stress from seeking legal support and make this process as convenient as possible for you and your loved ones, because your sole focus should be to recover. Our office is located in Salt Lake City, but our experienced and dedicated food poisoning lawyers will travel to your home or hospital anywhere in Utah. It is extremely important to get help from an experienced and knowledgeable attorney after you have suffered food poisoning from a business establishment. We will start building a case against the food provider immediately and protect you from being taken advantage of by their insurance representatives. Our priority is to maximize value for our clients, which is why we are not a volume-focused personal injury law firm. Lance Andrew, P.C. does not focus on getting the highest number of clients just to increase our own numbers. Our foodborne illness attorneys will dedicate the necessary resources and time to produce quality results for you individually. Lance Andrew, P.C. also has strong connections with a multitude of highly regarded industry professionals, including renowned medical professionals and foodborne illness experts. We work with them to build strong evidence against the food provider, preparing the best possible case for trial. We personally handle each case we receive. Many attorneys pass off cases to their junior attorneys or paralegals. The attorneys at Lance Andrew, P.C. handle each case personally. Our Utah food poisoning attorneys want to help you recover for the damages you sustained because of negligent businesses. Almost every industry that serves food can be capable of some form of negligence. Rules and regulations are in place to protect the public as much as possible from contaminated food. There are two kinds of food poisoning - mild and severe. Bacteria is all around us, so mild food poisoning is common and inevitable. However, problems arise when producers and retailers fail to prevent and get rid of the bad bacteria in our food supply in items such as spinach, tomatoes, and peppers. Serious and permanent personal injuries and even death can arise from food poisoning. Foodborne illnesses are especially dangerous in very young people or the elderly. These symptoms can appear as soon as 30 minutes after consuming contaminated food, or it can be dormant and appear several days later. If you get food poisoning under these circumstances and suspect you know what caused it, you need to speak with an experienced Utah food poisoning lawyer. Which germs & bacteria are to blame? Foods from animals, raw foods, and unwashed vegetables all can contain germs that cause food poisoning. The most likely source is food from animals, such as meat, poultry (chicken), eggs, milk, and shellfish (shrimp). Some of the most common bacteria are Salmonella, Listeria, and Campylobacter and E. Coli. There are many strains of E. coli bacteria. As a result, microbiologists categorize them into more than 170 serogroups and then further break down each serogroup into one or more serotypes. The serogroup is indicated by a number, and the serotype follows and is separated by a colon. The E. coli strain primarily responsible for E. coli-related injury and death is classified as Escherichia coli O157:H7 (E. coli 0157:H7); it belongs to the 0157 serogroup and the H7 serotype. Escherichia coli O157:H7 is a rare variety of E. coli that causes severe damage to the lining of the intestine. Specifically, the acute disease caused by Escherichia coli O157:H7 is hemorrhagic colitis. Escherichia coli O157:H7 can also result in hemolytic uremic syndrome (HUS), the leading cause of kidney failure in children in the United States. The Centers for Disease Control and Prevention (CDC) estimated in 1999 that 73,000 cases of E. coli O157:H7 occur each year in the United States. Approximately 2,000 people are hospitalized, and 60 people die as a direct result of E. coli O157:H7 infections and complications. The majority of infections are likely food-borne-related, although E. coli O157:H7 accounts for less than 1% of all food-borne illness. E. coli O157:H7 bacteria are believed to live in the intestines of cattle but have also been found in the intestines of chicken, deer, sheep, goats, and pigs. E. coli O157:H7 does not make the animals that carry it ill; rather, they are merely the reservoir for the bacteria. While most E. coli O157:H7 outbreaks have involved ground beef, other outbreaks have involved unpasteurized apple and orange juice, unpasteurized milk, alfalfa sprouts, spinach and water. Outbreak can also be caused by person-to-person transmission of the bacteria in homes and in settings like daycare centers, hospitals, and nursing homes. If you or someone you love has become seriously ill from E. Coli poisoning, contact us for a free legal consultation. You can reach our food poison lawyers by calling or by filling in our online consulting form. Salmonella is one of the most common enteric (intestinal) infections in the United States. 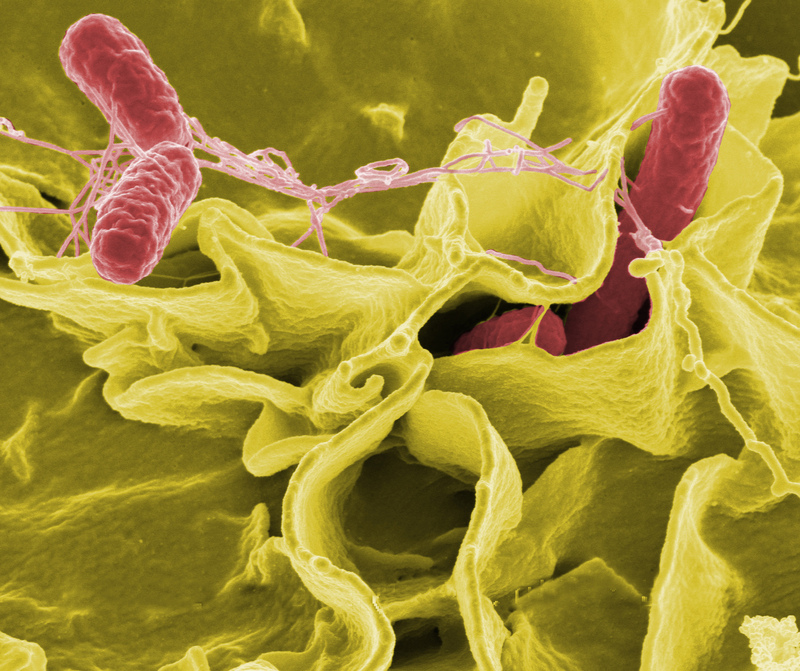 Salmonellosis (the disease caused by Salmonella) is the second most common foodborne illness after Campylobacter infection. It is estimated that 1.4 million cases of salmonellosis occur each year in the U.S.; 95% of those cases are foodborne-related. Approximately 220 of each 1000 cases result in hospitalization and eight of every 1000 cases result in death. About 500 to 1,000 or 31% of all food-related deaths are caused by Salmonella infections each year. Salmonellosis is more common in the warmer months of the year. Salmonella infection occurs when the bacteria are ingested, typically from food derived from infected food-animals, but it can also occur by accidentally ingesting traces of the of an infected animal or person. Food sources include raw or under-cooked eggs/egg products, raw milk or raw milk products, contaminated water, meat and meat products, and poultry. Raw fruits and vegetables contaminated during slicing have been implicated in several food-borne outbreaks. We are involved in representing families of children who have suffered from this bacterium. If you or someone you love has become seriously ill from Salmonella poisoning, contact us for a free legal consultation. You can reach our food poison lawyers by calling or by filling in our online consulting form. Listeria monocytogenes is a bacterium commonly found in soil, stream water, sewage, plants, and food. Each bacterium is Gram-positive and rod-shaped. Listeria are known to be the bacteria responsible for listeriosis, a rare but lethal food-borne infection that has a devastating mortality rate of 25% (Salmonella, in comparison, has a less than 1% mortality rate). They are incredibly hardy and able to grow in temperatures ranging from 4°C (39°F), the temperature of a refrigerator, to 37°C (99°F), the body's internal temperature. Furthermore, listerosis's deadliness can be partially attributed to the infection's ability to spread to the nervous system and cause meningitis. Finally, Listeria has a particularly high occurrence rate in newborns because of its ability to infect the fetus by penetrating the endothelial layer of the placenta. If you or someone you love has become seriously ill from Listeria poisoning, contact us for a free legal consultation. You can reach our food poison lawyers by calling or by filling in our online consulting form. Our knowledgeable and skilled attorneys have handled a vast array of foodborne illness cases. Please contact one of our food poisoning lawyers in Salt Lake City to guide you through the legal process of recovering the damages you have sustained from your injuries.